Victoria, BC – With the 2016 Summer Olympics officially coming to a close on Sunday, the Canadian Sport Institute Pacific (CSI Pacific) is proud to recognize the successes of Team Canada who brought home a record-tying 22 medals while representing 35 million Canadians in Rio de Janeiro. The 22 medals tie the highest ever for Canada at a non-boycotted Games. The Canadian Olympic Team featured 314 athletes, out of which 126 are CSI Pacific-affiliated. These 126 athletes benefited from services provided by CSI Pacific or a PacificSport Centre in B.C. in past year. Of the 22 medals won by Team Canada, CSI Pacific-affiliated athletes contributed to 11 of these medals, an impressive 50%. Sixty-one members of Team Canada won a medal in Rio, from the individual winners, such as Catharine Pendrel and Hilary Caldwell, to the teams of Women’s Soccer and Women’s Rugby Sevens. The Canadian Sport Institute Pacific is affiliated with 41 of these athletes – or a fantastic 67% of all of Team Canada’s medallists – having provided them support in the past year. CSI Pacific sent its largest ever contingent of staff to the 2016 Summer Games, with 12 staff members from six different disciplines – including one in the broadcast booth – serving national sport partners at the Games. This includes Samantha Ebata and Ryan Brodie, who worked as part of the Canadian Olympic Committee’s Mission Staff for Performance Analysis. Our staff provided the greatest amount of support to the bronze medal-winning Women’s Rugby Sevens team, with four of our staff members working with this team in Rio. 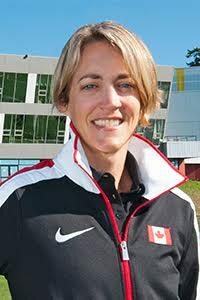 CSI Pacific staff members Dr. Cesar Meylan (Strength & Conditioning) and Rebecca Hall (Nutrition) worked closely with Canada’s Women’s National Soccer Team as they won a bronze medal and became the first Canadian women’s team sport to win back-to-back Summer Olympic medals. Innovation & Research Lead Dr. Trent Stellingwerff (PhD) and Chief Medical Officer & Health Science Lead Dr. Paddy McCluskey (MD) worked with Athletics Canada over the Olympics, as well, as Athletics Canada won its best medal haul since 1932. Dr. Stellingwerff has also worked closely with bronze medallist mountain biker Catharine Pendrel in the lead-up to the Rio Games.